The Parking Garage is located right across the street from the terminal, and it is joined by a covered walkway. Payment can be made by credit or debit card, personal checks and cash. The Parking Garage offers convenience, efficiency, and protection from weather elements. The Close-In Automated Lot is a surface parking lot located right across the street from the terminal, and is the closest surface parking lot to the terminal. This unattended automated lot accepts credit, debit, and cash payments. Cash payments can be made at one of two automated pay-on-foot stations. Credit or debit cards only are accepted at the vehicle exit. This lot is your best choice for short-term parking if you want to see your friends or family off, or welcome them upon their arrival. The Economy Lot is a surface parking lot and only a short walk from the terminal. Payment can be made by credit or debit card, personal checks and cash. The Park & Ride Lot is an automated lot, and the most economically priced parking on the airport at $8.00 per day. This unattended automated lot accepts credit and debit card payment only. A free shuttle serves the Park & Ride Lot, and cycles between the terminal and lot every 10 – 12 minutes, 24 hours per day, 7 days per week. The shuttle picks up and drops off passengers at each of the six shelters in the lot. The Cell Phone Lot is a complimentary lot intended for short-duration parking while awaiting your arriving family member or guest. You may park in this lot for free as you wait on your family member or guest. When they are ready to be picked up at the terminal curb they can call your cell phone and let you know. 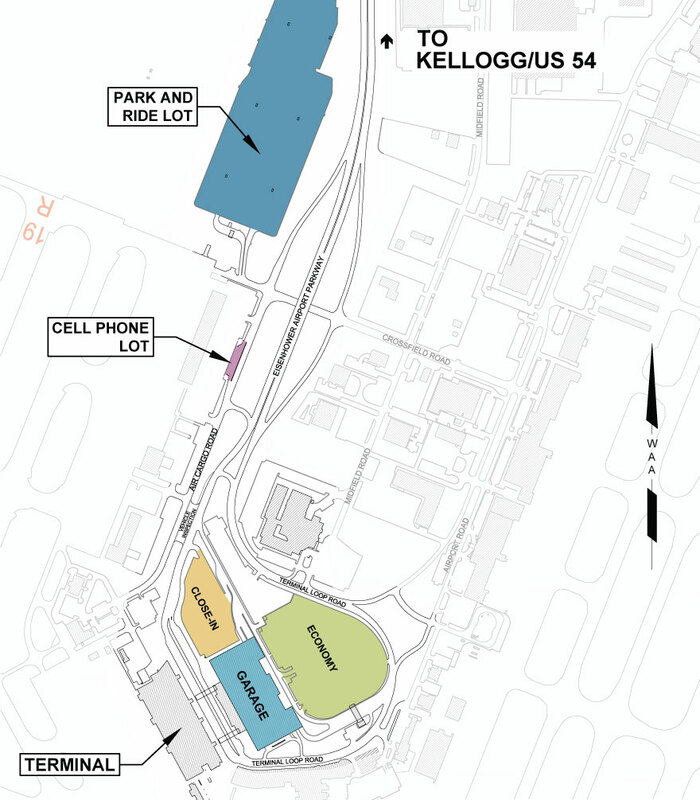 The short drive from the courtesy Cell Phone Lot to the terminal takes only about 1 ½ minutes.